Hello and welcome to Speaks with Ancestors! 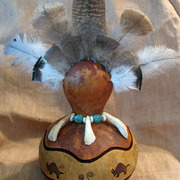 Here you will find creations inspired by our Ancestors and Mother Earth. Whether the designs came to me in a dream, vision, or were just a very strong instinct, I do the best that I can do to honor their requests and pay great attention to every detail. They are all one of a kind and will never be duplicated. Thanks for stopping by.